Use lattice multiplication to multiply numbers and find the answer using a lattice grid structure. Lattice multiplication is also known as Italian multiplication, Gelosia multiplication, sieve multiplication, shabakh, Venetian squares, or the Hindu lattice. It uses a grid with diagonal lines to help the student break up a multiplication problem into smaller steps. Create and print customized lattice worksheets to practice lattice multiplication. Select the size of the lattice you need and click the "Create Worksheet" button. A new page opens for your custom lattice. Print the lattice worksheet using the print function in your browser. Note that ads will not print. Wikipedia contributors. "Lattice Multiplication," Wikipedia, The Free Encyclopedia. Goodman, Len. "Lattice Method." From MathWorld--A Wolfram Web Resource. 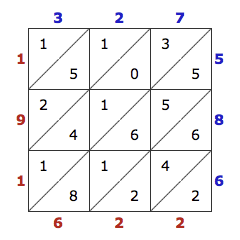 Furey, Edward "Lattice Multiplication Calculator"; from https://www.calculatorsoup.com - Online Calculator Resource.